Hector Olivera throwing to first. 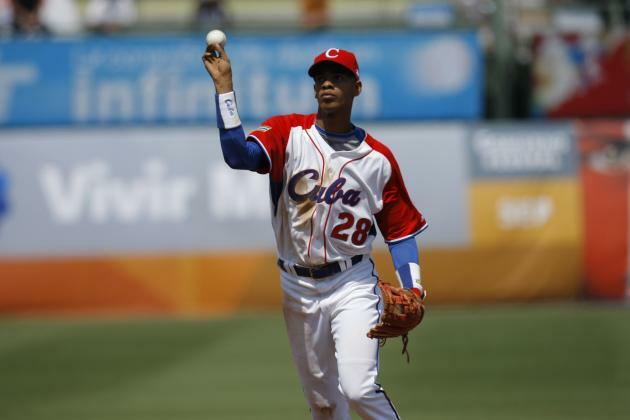 Hector Olivera, who defected from Cuba last September and still has to be cleared by the U.S. government before signing, is a 29-year-old second baseman who has received interest from the Yankees. The other teams that have interest in him are the San Francisco Giants, San Diego Padres, Texas Rangers and Atlanta Braves. According to Jesse Sanchez of MLB.Com, more than 200 scouts attended Olivera’s workout in the Dominican Republic last week. Baseball America ranked him as the No. 6 player in Cuba last August, which proves how talented he is. However, he missed the entire 2012-13 season due to thrombosis in his left biceps and hasn’t played in international competition since then. During the following season, in his return to Serie Nacional, he batted .317 with seven homers over 273 plate appearances. He was impressively able to accumulate more walks (38) than strikeouts (25). In the 2011-12 season, Olivera proved that he could truly do it all on offense as he hit .341 with 17 homers, 44 walks and only 22 strikeouts in 214 plate appearances. He ranked third in the league in slugging behind only Jose Abreu (who won the Rookie of the Year in 2014) and Alfredo Despaigne. A factor that takes away from Olivera’s value is that he spent most of last season at DH, which means it is still unknown if he can play second like he did before his injury. It is likely that he has regained some of his range and ability at second because those 200 scouts attended his workout, but it’s not known for sure. The Yankees should not sign Olivera because he is already 29 and has had a serious injury. He might have a few productive years left, but the Yankees already have Rob Refsnyder, who will be only 24 on March 26. Stephen Drew will likely be the second baseman to start the season, but it could take away from Refsnyder’s development if the Yankees sign another second baseman to compete with him. Refsnyder is coming off of a season where he greatly improved defensively (12 errors in 2014 / 25 in 2013) and produced very well on offense as he had a .318 average with 14 homers, 63 RBIs, 38 doubles and nine steals in 137 games with Double-A Trenton and Triple-A Scranton. The only thing he could improve on offense is reducing his strikeout to walk ratio since he had 105 strikeouts and 55 walks. Olivera is not worth the risk since the Yankees already have Refsnyder, who will either start the season in the Bronx, or be called up when he is ready defensively.